These days, France is not a particularly good place to be a Jew. The country that gave us the Dreyfus Trial in 1894 and the round up of Jews at the Vélodrome d'Hiver in 1942 has been the scene of some terrible acts of violence against Jews in the 21st Century. In 2006, the world witnessed the murder of Ilan Halimi, the Toulouse and Montaban killings in 2012, and anti-Jewish riots in 2014. In 2015, the world witnessed the Hypercacher massacre and in 2017 the murder of Sarah Halimi. All this violence bespeaks of a breakdown in French society, a breakdown that is causing many Jews to leave the country and immigrate to Israel. Once French-born Jews make it to Israel, France’s fecklessness follows them. In particular, France provides diplomatic cover to anti-Israel activists affiliated with the World Council of Churches (WCC), an ecumenical Christian institution with a sad history of being soft on Communism and more recently, jihadism, going so far as to obstruct efforts to address antisemitism at the UN’s anti-racism conference in Durban in 2001. In particular, the French government provides diplomatic cover to the Ecumenical Accompaniment Program in Palestine/Israel (EAPPI) in the compound of St. Anne’s Church located in the Muslim Quarter of the Old City of Jerusalem. The property was given to France by the Ottoman Empire to the French government in 1856 in gratitude for assistance given during the Crimean War. The church is managed by The Missionaries of Africa, sometimes called “The White Fathers,” a Catholic missionary organization established in 1868 with the goal of converting Arabs to Christianity. Behind a stone wall and a sign telling people to keep out is a parking lot and a group of office buildings that houses the EAPPI and another WCC-supported institution, the Jerusalem Interchurch Center (JICC). By virtue of its presence in the St. Anne’s compound, EAPPI enjoys diplomatic refuge from Israeli law enforcement. Because the church is the property of the French state, Israeli police cannot enter into the property without permission from the French government. To underscore French sovereignty over the site, a French flag flies over the property. French protection for EAPPI at St. Anne’s Church came under public scrutiny in 2016 when the Christian Empowerment Council (CEC) wrote a letter to the French Ambassador to Israel about the protection afforded to the activist organization. Apparently, no one in France’s diplomatic corps wants to talk about who made the decision to allow the EAPPI to take up residence at St. Anne’s in Jerusalem — nor does anyone in the religious community that manages the site. Email inquiries to the Missionaries to Africa in Jerusalem and to French diplomats in Washington, Tel Aviv and Jerusalem yielded no response. An official working for Missionaries of Africa in Washington, D.C. referred all inquiries back to the monastery in Jerusalem, which had already failed to respond to inquiries. In order to understand why EAPPI’s presence at St. Anne’s is so controversial, it’s necessary to know something about the organization’s background. Established by the World Council of Churches during the Second Intifada at the request of the Heads of Churches in Jerusalem, EAPPI sends activists into Israel from around the world ostensibly to stand in solidarity with Palestinians during confrontations with Israeli soldiers and with Israeli civilians who live in communities in the West Bank. The stated goal is to reduce violence and human suffering. According to NGO Monitor, an organization that documents the role non-profits play in the propaganda war against Israel, funding for EAPPI is provided by a number of sources, including the Norwegian Ministry of Foreign Affairs, the Canadian government (through UNICEF) and the Catholic Agency for Overseas Development. 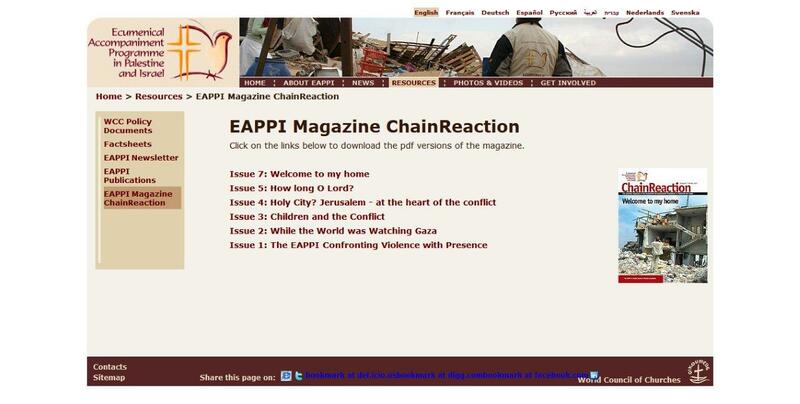 EAPPI has come under intense criticism (some of it written by this writer) from groups like the Committee for Accuracy in Middle East Reporting, NGO Monitor and others who accuse the organization’s activists of using the confrontations between Israelis and Palestinians as opportunities to obtain images of Israelis behaving badly and then using these images to broadcast an anti-Zionist propaganda to Christians throughout the world. The article did not say exactly what countries should have their websites hacked, but the context made it clear that the article was encouraging people to hack Israeli government sites. In practical terms, this means ignoring issues of anti-Jewish or anti-Israel incitement in Palestinian society while focusing intensely on Israel’s alleged misdeeds. Broadcasting this narrative is a huge part of the EAPPI agenda. Applicants who want to serve as EAPPI activists are asked to tell the WCC how skilled they are with the use of digital and video cameras and at transferring photos and other data between devices. Moreover, they are asked if they belong to church-related, ecumenical, faith-based or civil society networks that can be used to “assist in advocacy work during and after” their service as accompaniers. When their service in Israel and the West Bank is over, EAs go home and engage in a lot of anti-Israel activism, reports Itai Reuveni, a researcher with NGO-Monitor. Their audiences believe them because they can say, “I was there,” Reuveni reports. Israelis have long been concerned about EAPPI’s activism outside of the Holy Land, but in recent years, there has been increased attention devoted to the organization’s actions inside the state. One Israeli activist, who has asked to remain anonymous to prevent his identity from being ascertained by Palestinians who may seek to harm or intimidate him, began shadowing EAs in 2015 after witnessing their behavior near his home in the West Bank in 2015. He asserts that EAPPI activists do not tell the truth to security officials about their intended activities when they enter the country. Moreover, he claims that EAPPI activists ignore Palestinian violence during confrontations in the West Bank. EAPPI activists ignore this Palestinian violence, he concludes, because such acts do not fit in with their goal of gathering images of Israelis behaving badly to be deployed in anti-Israel campaigns for use back home. It’s hard to argue with the Israeli observer about this issue. Condemnations of Palestinian violence are few and far between in WCC and EAPPI messaging about the Israel-Palestinian conflict. Activists from the organization, the source asserts, engage in political activism in violation of the terms of the tourist visas they use to get into the country. Israelis also complain that the organization’s activists affiliate with radical groups such as International Solidarity Movement (ISM), Anarchists Against the Wall and Ta’ayoush, organizations that promote Palestinian propaganda, give Palestinian leaders a pass for their misdeeds, and thereby make it harder to achieve peace between the Israelis and the Palestinians. He also reports that EAPPI activists sometimes disobey Israeli law by going into closed military areas in an attempt to prevent confrontations between Israelis and EAPPI activists. In light of the concerns raised by this Israeli who has been closely monitoring the actions of EAPPI activists in Israel for the past few years and by researchers at NGO-Monitor, this writer, a researcher from the Committee for Accuracy in Middle East Reporting in America (CAMERA) who has written regularly for The Jerusalem Journal, concluded it was necessary to present these concerns to the WCC itself and seek a response. To that end, he sent a lengthy email asking for a response to Marianne Ejdersten, WCC’s director of Communications on June 5, 2018. Ejdersten responded to these questions with an email on June 8, 2018 and stated that if there were any more questions, she would answer them. A series of follow-up questions (which presented evidence and claims that served to contradict statements made in response to the first round of questions) were sent on June 11. Ejdersten initially agreed to answer these questions, but on June 13, Peter Prove, Director of the WCC’s Commission of the Churches on International Affairs sent an email saying that WCC staff was too busy preparing for an upcoming meeting of the WCC’s Central Committee to be able to invest the time necessary to respond to the queries. “I suggest that you publish with the information you already have from us,” he wrote. After this, this writer obtained numerous images and some videos that document persistent interactions between EAPPI activists and a particularly aggressive Palestinian Activist, Hasan Breijieh. In 2016, Breijieh wrote a poem lauding the potential slaughter of Israelis (more about him below). Subsequent emails were sent in an effort to elicit a response from the WCC. The emails were sent on June 14, 2018 and a few hours after they were sent, the WCC said it was looking into the issue. When and if the WCC responds to these concerns, the organization's response will be posted. It’s not a one-time thing. 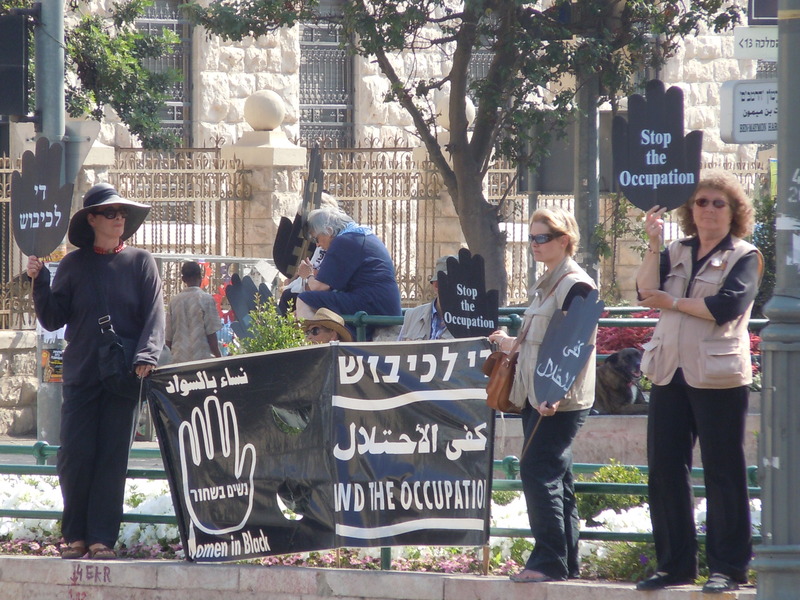 The Jerusalem Journal has obtained photos of EAPPI activists protesting with Women in Black as late as 2016. The WCC’s denial that EAs engage in political activism in Israel, despite readily available evidence to the contrary, indicates that, at the very least, the left hand (at WCC’s headquarters in Geneva) does not know what the right (in the Holy Land) is doing. It raises a question: Just how much oversight does the WCC provide the EAPPI program? This and other questions were put to the WCC in the second round of queries mentioned above, but unfortunately, the organization would not answer them. Local churches that support EAPPI recruit, vet volunteers and train them for a few days and tell them how to get into the country before sending them to the Holy Land, reports Itai Reuveni, a researcher from NGO Monitor who pays close attention to the organziation. Reuveni reports that EAPPI activists do not come as a group into Israel, but as individuals who then connect with the folks at the Jerusalem Interchurch Center (JICC) led by Palestinian Christian Yusef Daher. EAPPI’s website describes the JICC as a “partner” and lists Daher as an ex-officio member of the “Local Reference Group” that “provides guidance, advice and support” to the EAPPI program. In one Facebook posting, Daher invoked the prayers of Palestinian Christian terrorist George Habash who led the Popular Front for the Liberation of Palestine (PFLP), the group responsible for the 1972 Lod Airport Massacre which resulted in the death of 27 tourists. Given his polemics, Daher is simply not the person reasonable people would want involved with a program ostensibly dedicated to “promoting a just peace” between Israelis and Palestinians, but the EAPPI openly acknowledges his involvement with its “peace” activism. Sadly, there are indications that some EAs have followed Daher’s example of using ugly polemics to demonize Israel. In 2016, the Jewish Chronicle reported on a public presentation offered by two former EAPPI activists in England. At the presentation, a former EA complained of a “Jewish lobby” while another EA promoted the website of “If Americans Knew,” a group so hostile to Jews and Israel that Jewish Voice for Peace announced in 2015 that it would not work with it or its founder, Sara Weir, because of its affiliations with openly antisemitic groups in the United States. The same source declares that the organization’s activists come into Israel on tourist visas, fail to honestly inform customs officials as to why they are entering the country and then engage in political activism and confrontations with Israeli soldiers, police officers and even private security companies—all in direct violation of Israeli law regarding tourist visas, says the source. “The volunteers simply lie when they come to Israel,” he says, adding that some volunteers have overstayed their three-month visas and other times, they would go into Jordan for a few days and come back into the country on a new tourist visa. “I don’t think that happens much any more, but from 2002 to 2016, they operated freely,” he said. The issue of activists associated with EAPPI using tourists visas to engage in political activism has been a growing point of conflict between the WCC and Israel. In December 2016, Isabel Phiri, Associate General Secretary for the WCC, was denied entry into Israel. Haaretz reported that the written explanation given to Phiri for the decision was that she was refused entry “to prevent illegal immigration.” The same article reports that a spokesperson for Israel’s Public Security Minister stated that her denial was based on her role in promoting anti-Israel boycotts. The issue has not gone away. In January 2018, Haaretz reported that an employee from a Norwegian aid group was denied access to Israel on the grounds that she “requested visas from volunteers under false pretenses.” A newspaper in Norway reported that the employee was affiliated with EAPPI. Because of events like this, some Israelis regard EAPPI with great suspicion. “The whole organization is premised on denying Israel’s right to control its borders,” says the activist who has been monitoring EAPPI’s actions since 2015. The issue of what Christian “peace” activists should say to Israeli immigration officials upon entering the Holy Land has been an issue for at least one other Christian organization. In February 2012, the organizers of the Christ at the Checkpoint Conference (CATC), an anti-Zionist event sponsored by Bethlehem Bible College and which takes places every even-numbered year, instructed attendees to be less than forthcoming with Israeli officials at Ben Gurion Airport. At the 2018 CATC conference, an organizer announced that the author of the email, a long-time activist from the United States affiliated with the United Methodist Church, had not been allowed back into the country to help Bethlehem Bible College prepare for the conference. No details were given as to why. An email inquiry to CATC conference spokesperson Munther Isaac received no response. The Israeli source who started observing EAPPI activists after seeing them in action in an Arab village close to his home in the West Bank asserts that the organization’s bias can be seen in how its activists respond to Arab violence against Israelis. “We have a road from our village that goes to Efrat,” he says, adding that the road crosses through the Arab village of Tuqu’ which has two schools near the road where EAPPI activists sometimes gather. Students from the schools sometimes throw rocks at Israeli motorists who drive through the village and these incidents of rock-throwing prompt the IDF to chase and arrest the students. “And sometimes they shoot tear gas in order to get the students away from the main road so they will not hit the cars,” he said. EAPPI activists cooperate with anarchist groups such as the International Solidarity Movement and sometimes enter into Jewish communities in the West Bank on Shabbat in hopes of provoking confrontations with Israeli Jews on their holy day, the Israeli critic of the organization reports. The Israeli source is adamant that EAs have engaged in the confrontations he described. “Between April and May 2016, they came five times—Shabbat after Shabbat,” he said, adding that after the first few confrontations, the IDF declared the communities where EAs were protesting as closed military areas in an effort to prevent violent confrontations between the accompaniers and people who live nearby. In case there is any doubt about the authenticity of the video, Breijieh himself posted a video on his Facebook page of an ugly confrontation between Palestinians (including Breijieh) and Israelis living in the West Bank on May 7, 2016. During the confrontation, which takes place with EAPPI activists standing nearby, Breijieh yelled at Israelis, telling them to leave their land. “You are illegal here,” he screamed at an Israeli who came out to document his presence near his home. At no point during the video did an EAPPI activist seek to calm things down as Breijieh screamed at the Israeli. At this point, it seems reasonable to ask, "Where is Jesus in all of this?" The WCC is, after all, ostensibly a Christian organization. Would Jesus stand in solidarity with a man who antagonizes and demonizes Jews the way Breijieh has or would he confront him over his hate and hostility? Are the EAs truly witnessing to the love of Christ as they "accompany" Breijieh as he screams at Israeli Jews? The EAS who accompany Breijieh cannot honestly describe themselves as "fools for Christ." They are fools for a violent national cause whose leaders have turned down numerous offers of statehood and who have deployed Jew-hatred as a way to stay in power. The EAs are definitely not fools for Christ. They are fools for grievance, hate and terror. "Why this shyness on your face??? Your place is not here !!! You came from behind the seas !!!! But you chose to be a coward terrorist………. Taken in context, the reference to William Wallace seems to convey the hope that the target of Breijieh’s polemics will be murdered sometime in the near future. These is not the rhetoric of a non-violent activist for the Palestinian cause, but of what can more accurately be called a "war activist," or someone who tells a story to incite and/or legitimize violence in a conflict setting. Before readers dismiss this appelation out of hand, they have one embarassing fact to address: Counterpunch, a far-left publication, has described Breijieh as a spokesperson for the Popular Front for the Liberation of Palestine, which has been designated as a terrorist organization by the U.S. State Department. Why are EAPPI activists associating with such a man? He openly incites violence against Israelis and yet WCC activists are accompanying him as he walks into Israeli communities on their Sabbath. These are not the actions of a legitimate Christian peace organization. Breijieh’s involvement with EAPPI activists is not incidental. If you look at Breijiehs’ Facebook page, you’ll see numerous photos of him posing with EAPPI activists. During the five confrontations that took place, EAPPI activists were present every time, the source said. On this last point, that “ISM proclaims a commitment to non-violence in its work,” it is fair to say the WCC is being obtuse. The vests worn by EAPPI activists give them a false credibility when dealing with IDF and Israeli police that they do not deserve, the Israeli critic of EAPPI says. “It’s the vests that give them an official look, but they’re just tourists,” he said. We believe in a just and lasting settlement of the Israeli-Palestinian conflict through peaceful means and the end of the Israeli occupation of the West Bank including East Jerusalem and Gaza. We are committed to principles of nonviolence. We do not take sides in this conflict and we do not discriminate against anyone but we are not neutral in terms of principles of human rights and international humanitarian law. We are committed to the principle and practice of promoting human rights through our work. Our primary motivation is the alleviation of human suffering. Our engagement in this conflict is conditional upon an invitation to engage by local actors such as the Churches, church-related organizations, Palestinian civil society and Israeli peace organizations. We are committed to working in collaboration and in complementary ways with individuals, organizations, governments and other institutions which can contribute to the prevention and resolution of conflict and which work on human rights. We make no discrimination on grounds of nationality, race, class or gender, sexual orientation, age, or religious, cultural and or political beliefs. A close examination of these principles reveal they are not directly related to the behavior of accompaniers themselves and provide little if any guidance as to what type of behavior people can expect from EAPPI activists in the field. “I think in some ways they feel they are superior and come here to teach us how to behave,” the previously quoted Israeli activist asserts. Rhetoric like this is not going to assuage EAPPI’s critics in Israel who have started to inform their fellow Israelis about the group’s antics in the Holy Land. All this brings us back to France’s willingness to allow EAPPI to use St. Anne’s Church as its headquarters. By allowing EAPPI to take up residence at St. Anne’s Church, France is providing diplomatic cover to an organization that apparently facilitates the violation of Israeli law regarding who it lets cross its borders. This same organization facilitates and gives cover to the harassment of Israeli Jews by Palestinians in the West Bank. In other words, France, a country that can’t project sovereign power and authority into growing sections of its own territory, is giving aid and comfort to Palestinian efforts to undermine the sovereignty of the Jewish homeland. That doesn’t seem right. Not one bit.